The FGC-200-DU1 demonstration unit provides user interface for the FGC-200 function generator to demonstrate its functions and performance. The FGC-200-DU1 combined with the FGC-200 can be used as a simple laboratory function generator. The demonstration unit implements the function generator by providing power, an array of switchable timing capacitors, potentiometers as timing resistors, and a switch for switching output waveforms to a BNC connector. The unit is designed with the same dimensions as the FGC-200 to fit over it in a mezzanine style assembly. The power supply section can supply either a raw 5 V from a USB connection or a regulated 5 V from an on-board low-dropout regulator. The demonstration unit can be powered with either a USB connection or a 2.1x5.5 mm barrel jack that supplies 6 to 12 V. The user can choose between the two sources of 5 V through an on-board slide switch. Typically a USB power source is more readily available and electronically cleaner than a wall-wart. The range selection section consists of an array of timing cappacitors that are selectable through a DIP switch. Each of the capacitors have their own damping resistors to suppress parasitic oscillations. On a prototype build, 100 Ω resistors were used on the larger value capacitors. The capacitors were chosen to have low temperature variation characteristics (e.g. NP0) as cost and availability permits. The capacitors were chosen to allow the function generator to generate frequencies from 0.1 Hz to 40 MHz. 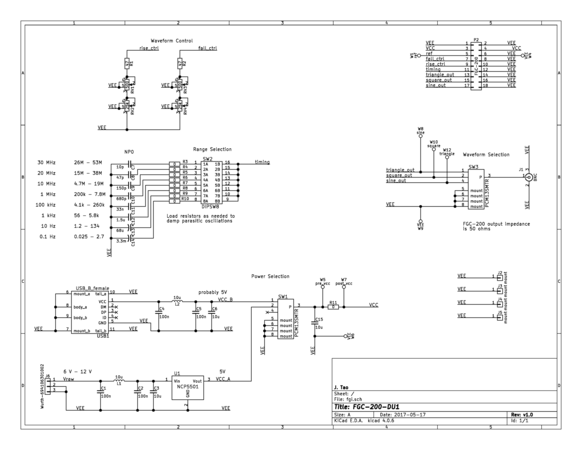 The frequencies listed on the schematic are approximated values found through simulation. Towards the high frequencies, tunability decreases, leading to a need for more capacitors for a given frequency range. The waveform control section allows the user to control the rising and falling edges of the generated waveform through potentiometers. For each edge, there is a potentiometer for fine adjustment and another for coarse adjustment. The demontration unit allows adjustment of the timing resistance from about 47 Ω to 25.5 kΩ. The waveform selection switch allows the user to switch between the generated square, triangle, and sine waveforms for output on the BNC connector. These outputs are directly driven through 50 Ω outputs from the FGC-200, so the output on the BNC connection should be terminated with 50 Ω for best results. The waveforms are all centered around 2 V from the assembly's ground. The output of the function generator can tolerate DC voltages as long as the sourcing or sinking current remains below 200 mA. The demonstration unit includes test points and jumpers to help evaluate the function generator. The ref (W1) is a test point for the function generator's bandgap reference voltage output, which should be measured or used with high impedance. The sine (W8), square (W10), triangle (W12) test points provide access to the signals before the waveform output switch. The pre_vcc (W5) and post_vcc (W7) test points allow measurement of the function generator's current.